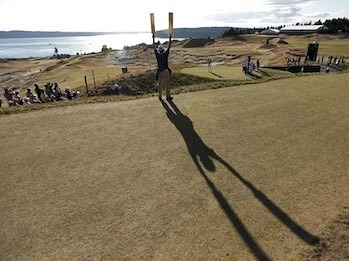 In its first year televising the U.S. Open Golf Championship it’s convenient for Fox to compare its numbers to last year’s, but this results in an apples-to-oranges comparison since this year’s tournament is being played on the west coast and airing in primetime in the east coast and last year’s tournament didn’t. The last time the tournament was played on the west coast and aired in primetime on the east coast was 2012. For its first-round coverage Fox’s 1.95 million viewer average across Fox Sports 1 and Fox legitimately bested 2012’s first-round (1.87M) and was the most-watched first-round since 2002. But coverage of the second round averaged 1.97 million and was well short of 2012’s second-round average of 2.909 million* and also fell short of the 2010 Open’s second round of 2.13 million viewers for the second-round. Like 2015 and 2012, 2010’s Open was played on the west coast and aired in primetime on the east coast. Fox’s 2nd-round coverage even fell a bit short of 2013’s second round that averaged 2.095 million and that one didn’t air in primetime. *If memory serves, in 2012 Tiger did not play in primetime for the first-round coverage but did in the second-round, the opposite of this year. Tiger missing the cut plus Rory being way off the pace (and Phil being even further off the pace) aren’t working in Fox’s favor this weekend, but we should at least get an idea of what kind of star power Dustin Johnson and Jordan Spieth really have as far as the TV ratings go. This is a disappointment. I’ve been watching the US Open broadcast on NBC for 40 years. The broadcasters and coverage far exceed that of Fox. Compare the number of viewers with that of NBC or ABC for that matter. Then you get a true comparison for appeal from your audience. A shame.